If you happen to think killing two birds with one stone is a bit inefficient, or you have found your way into a zombie apocalypse, you might be interested in a special type of gun known as a “punt gun,” that used to be somewhat common among commercial waterfowl hunters. What’s so special about this gun? It is capable of killing upwards of 50-100 birds in a single shot. Market hunters first made their appearance in what would become the United States around the time of the Pilgrims and continued plying their trade en masse until around the beginning of the twentieth century. Some earned their living by bringing as many ducks or other waterfowl to market as possible. While various methods were used for bringing down the maximum number of birds per hunting trip, the most effective was ambushing a large flock with a punt gun. As you might imagine from this, they were too heavy and the recoil too strong for a hunter to fire them by hand. Instead, they were (usually) mounted to small, often flat bottomed, boats known as “punts.” Hunters aimed the gun by maneuvering the boat into position one or two dozen meters from their targets, and then fired.First put in use in the 1800s, the punt guns were never manufactured on a large scale, with each being custom made by a gunsmith to fit a buyer’s specifications. But in general, the barrels had openings upwards of 2 inches (5 cm) in diameter and weighed over 100-pounds (45 kg). They generally could fire more than a pound of shot at a time and usually measured over 10 feet (3 m) long. That said, not all punt guns were always mounted to boats. One of the smallest examples of a punt gun is the Herfurth’s Cannon. Crafted by German gunsmith August Herfurth in Wisconsin, it measures 63-inches (160 cm) long and includes a 46-inch (116 cm) long Remington octagonal barrel with a one-inch diameter. As for the weight, it’s approximately 26-pounds or just under 12 kilograms, making it a featherweight compared to most punt guns. However, it is still much too big and has too much kick to be fired like a normal shotgun. But its relatively small size did allow the owner to hunt from the shore with proper bracing before pulling the trigger. 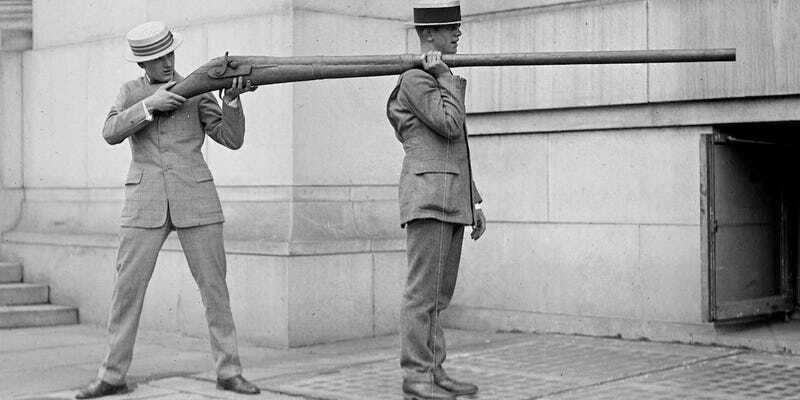 On the other end of the spectrum, the world’s largest punt gun, “Irish Tom,” was reported to have taken down a little over 100 birds with a single shot, according to its original owner. (However, a more usual haul per shot was in the typical range of 50 birds, give or take a dozen or two.) Irish Tom’s barrel measures more than 14-feet long (4.2 m), and the whole gun weighs more than 300 pounds (136 kg)! More akin to a cannon than a shotgun, it could fire over three pounds of shot with the help of about 10 ounces of black powder. The size of Irish Tom meant its first owner was forced to build a specially reinforced punt boat 24-feet long. As an example of how effective this was, a market hunter in the eastern United States, Ray Todd, claimed he and three other hunters with punt guns managed to kill 419 ducks one night in a single volley after encountering a huge flock “over a half-mile long and nearly as wide.”Market hunters used punt guns from the nineteenth through the early twentieth century. The hunters often worked in groups of eight to ten and fired their combined punt guns at the same time to maximize the number of waterfowl they could hit. Not surprisingly, in the years after market hunters began using punt guns, the population of wild waterfowl began to decline in the United States dramatically. Punt guns most certainly played a role in the decline along with the decrease in available habitat. Sportsmen who hunted for personal use of the killed waterfowl, rather than for profit like the market hunters, began advocating for hunting regulations and limits. In response, many states in the U.S. outlawed the use of punt guns by the 1860s, while the Lacey Act of 1900 and the Migratory Bird Treaty Act of 1918 effectively ended their use in the country. That said, punt guns are still legal in the United Kingdom, though their barrels are restricted to a diameter less than 1.75-inches. Hunters must also have a permit from the government for the gun and black powder, and they must adhere to strict hunting seasons. All this hasn’t proved much of a problem as there are only a few dozen currently used punt guns left in the U.K. today. Sarah Stone writes for the wildly popular interesting fact website TodayIFoundOut.com. To subscribe to Today I Found Out’s “Daily Knowledge” newsletter, click here or like them on Facebook here.